"When you have swum in natural water I think you develop a love of it. Then you want to replicate it in your garden. It's like wild swimming - but your very own wild swimming experience where no-one else is going to disturb you." "It's natural and it's clean as well, it's a real pleasure. And surprisingly warm." 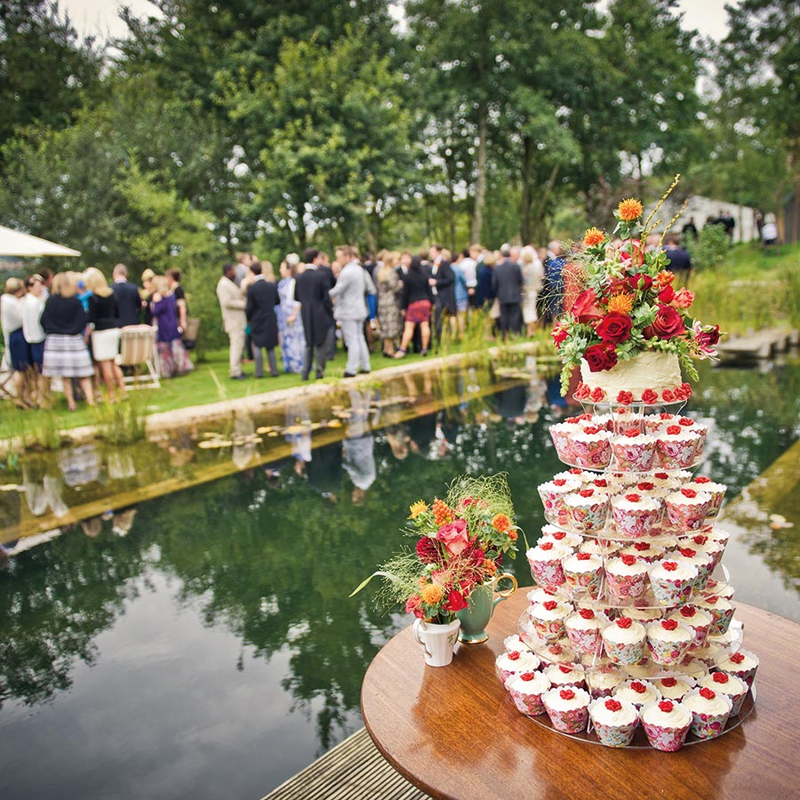 "It's had a lot of use – we've used it more than we used the swimming pool. Even when it's not been fantastically sunny we've been in it and it's been very enjoyable." "The whole family loves it. We all swim in it, but the girls are also fascinated by the wildlife that congregates around the planted area. As for me, I'm drawn to the space in a way I would never be with a conventional pool. I just want to sit out here with a cup of tea, absorb the peace and contemplate the world." "It's really pleasant... it's really nice to be in water that you don't have to rinse off afterwards." "Walking over the stepping stones is hugely satisfying. In the summer the children will walk backwards and forwards over these stepping stones for hours, and they see little things creeping about. It's beautiful. The kids spend hours here, just hours and hours." "I like it – it teaches the children many things, like fishing for tadpoles, looking around the rocks, seeing the plants growing, seeing the swallows diving, seeing the damselflies... the children just love it, it doesn't matter what the weather. They just run straight in, no matter what the temperature is. The children are just drawn to it, they don't feel the cold. I'm sure it's good for them." "The boys love the wildlife, and the experience of swimming in pure, natural water." "They’ve got a safe environment where they also can act out those sorts of childhood adventures." "The water quality is so good that we have baby newts, damselflies, dragonfly larvae, it’s fascinating." "The water is beautifully clear and people are genuinely fascinated by how something so visually pleasing can work so well." "If feels silky. Also after the children have been in you don't have to worry about them having a bath afterwards." A conventional swimming pool uses chemicals to kill micro-organisms in the water. However this isn’t necessary in a natural pool where the cleaning work is carried out by micro-organisms which exist together in equilibrium. "You're much more likely to be outside. Even in the winter we'll go up there. I've bought a little fire and you can go up there and still enjoy it with the little fire going." "Everyone who has seen our natural pool has been enchanted with its beauty at all times of year." "I think the main thing though is that it looks lovely all year round. Everyone I know who has chlorinated pool puts a cover on it in September and that stays there until Easter. So realistically they are looking at their lovely glistening swimming pool for 4-5 months a year. The rest of the time they are looking at a cover... Even in the winter you look at it and your eye is completely drawn to it." A large proportion of a swimming pond's space can be devoted to aquatic plants, making it as much a garden feature as a pool. It can be admired year round without the need to be covered at the end of summer. Constantly alive and evolving, our ponds change with the seasons, maturing over the years and allowing the plants to grow into their habitat. For more details see What happens in the winter? "I love it at all times of the day and night and in all seasons..."
"Not just when it’s boiling hot sun and you go in and out all day..."
"When it’s ice cold and frosty it just looks mystical." "It gets the sun all day so the temperature is fantastic. You can swim quite early on in the year and you can still swim in September. It gets up to 26 degrees in the summer. The shallow parts keep it warmer." "I wouldn’t say we’ll swim throughout the year but I was going in until late October!" "The water temperature is much better than we expected. We have seen averages of 23 and 24 degrees for long periods." "Last year we swam most days from May 15th to the end of September. We have no added heating, as it has proved to be unnecessary." 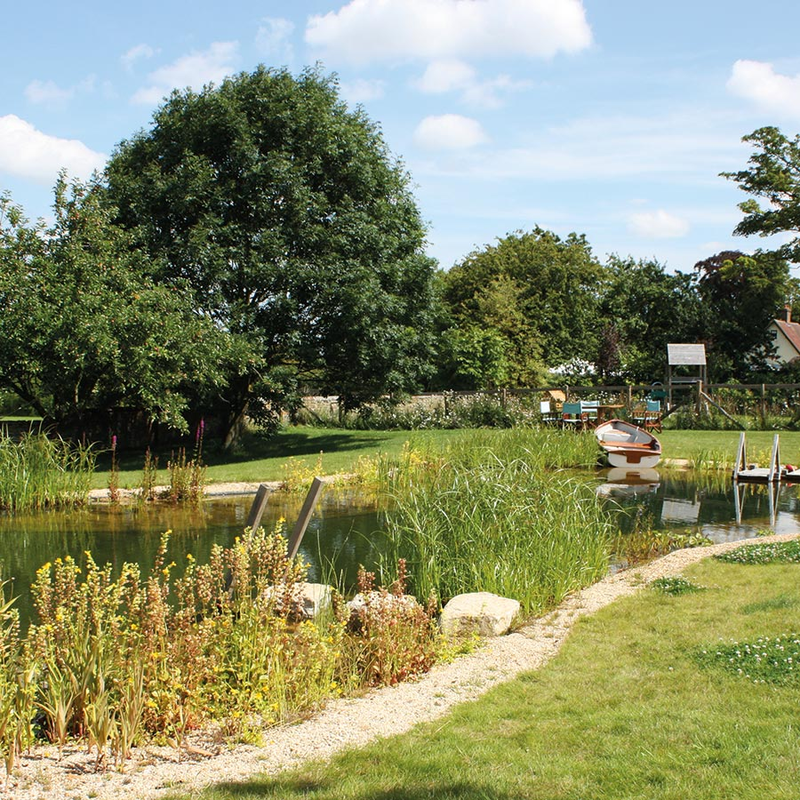 Water in the shallow areas heats up quickly in the sun and can raise the natural temperature of the whole pond to 24 or 25 degrees C in the summer. Read more about how our ponds may be heated here. Though the best thing is to try swimming for yourself at one of our open days, find out more in the events page. "It’s lovely. It’s to do with being outside, there is something elemental about it, the fact that there are bats flying about at night, the fact that the water quality is so good that we have baby newts, damselflies, dragonfly larvae, it’s fascinating." "There’s something about the fresh smell of the clean water that draws you to it and resonates with all your senses. That’s when it seems to connect completely to your soul." "As for chemicals, well, none of us wants to be swimming in chlorine any more. Also we don’t have to change the water as you do with a conventional pool." 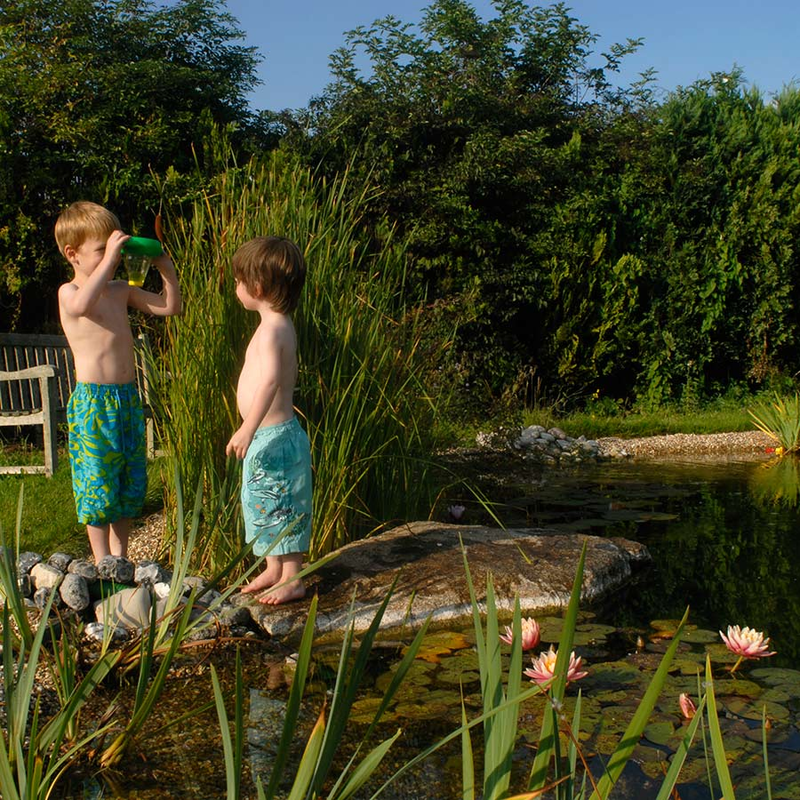 A natural swimming pond needs much less maintenance than a conventional pool, as there are no chemicals to manage and the water does not need to be drained for cleaning and repairs. Read more about maintenance here.